Jim Rash has a way with funny degenerates: As recurring Reno 911! character “Andrew, The Whore House Guy,” Rash turned up in a number of compromising positions around The Biggest Little City in the World; he can currently be seen as Community’s Dean Craig Pelton, a community-college administrator who, over the course of two and a half seasons, has blithely blackmailed a student, consistently violated dress codes, and twice turned Greendale Community College into a paintball-strewn war zone. But Rash is more than his character’s over-the-top proclivities. He’s also an Academy Award winner, thanks to the screenplay for The Descendants, which Rash wrote with longtime writing partner Nat Faxon and the film’s director, Alexander Payne. With two film projects alongside Faxon on the horizon—the duo’s co-directorial debut, The Way, Way Back, this summer and a starring vehicle for Kristen Wiig, a fellow alumnus of Los Angeles’ storied Groundlings comedy troupe—the actor-writer-director makes his return to Greendale when Community’s third season resumes on Thursday, March 15. In anticipation of the show’s return, Rash spoke to The A.V. Club about his Oscar moment, what’s to come after Community’s “long, dark semester,” and the perils of tackling the love theme from Batman Forever. The A.V. Club: It’s been a good year for you: Starting with your promotion to series-regular status on Community, and now you’ve won the Oscar for The Descendants. How do you follow that up? Jim Rash: Well, I gotta get my country album out. I’m gonna lay a few more tracks, and I’m sure Donald [Glover]’s gonna want to get involved with this. So we’re very excited. AVC: If you were to record a country album, what would the title be? JR: Oh, God. Um—Pancakes And Dreams. [Laughs.] I have a feeling it’s just going to jump off of the shelves. AVC: The way your year’s going, it would have to. JR: Absolutely. As soon as you see my face on the cover of Pancakes And Dreams, it pretty much feels like the country album you have to own, even if you don’t like country. AVC: The name “Jim Rash” just screams country. I don’t know what’s next. Writing, I know that. Hopefully Community, come late summer. So in a way it’s sort of like continuing what I’m doing. AVC: Going back to Oscar night: You’re onstage, about to accept the Oscar for Best Adapted Screenplay. Was it just an old improv instinct that kicked in, encouraging you to strike the Angelina Jolie pose? JR: You know, it’s weird. Some people agree with me, understand what I’m saying—but as you’re waiting for that moment, for that envelope to be opened, Angelina got onstage, and with her pose and stance—I just thought it was fun because I thought she was owning and having fun with and rocking her outfit. When I got up there, we were proud, it was this long journey and all of a sudden your name is read and you’re outside of your head, and I thought “What a great way to just show off a proud moment”—with the Oscar on my leg. [Laughs.] I guess I didn’t see it as mocking. [Jolie] was doing it and owning it and having fun, so I thought that would be fun to see my version of it. I wouldn’t call it mocking, like everyone did. I felt bad that was the reaction. I was just having fun, so hopefully she took it all in good fun. AVC: Have you heard anything from the Pitt-Jolie camp? JR: I can’t imagine. Most people I’ve spoken with who have met her and him say they have a great sense of humor. All I was doing was doing my version of that proud moment, whatever it is. Doesn’t mean I won’t write her a letter. [Laughs.] Why not. AVC: How would that letter start? JR: “Dear Angelina. I’m the bald, bespectacled guy.” Probably something I would do, though, because I just want her to know what I was thinking. Neurotic. AVC: Is there any chance that Dean Pelton will end up in a similar dress? JR: Not in season three, because that’s already been shot. But I don’t know. That would maybe make us too meta, if our personal lives were inching their way into the world of the show. But who knows? I’ve already worn more revealing dresses than that. And I’ve even made a stance like that when I was in the dean’s sister’s Fourth of July outfit—leg cocked to the side. I feel like you could even look at that Oscar pose as a nod to Dean Pelton. AVC: Can you say for certain that you’re the first Oscar winner to ever be discovered by the Reno Sheriff’s Department with an “apparatus” strapped to your head? AVC: Do you think your Oscar win gives Community any sort of extra clout for securing a fourth season? JR: I can’t imagine. In the sense that I would never want to assume that would do it. I hope that it’s renewed based on why I think it should be—the merit of the show, the merit of the writing, and the amazing cast. And the fact that the fans reacted so viscerally, positively—in the sense that when we were removed from the air, fans were so outspoken. And I just know that this is a show that no matter what, it would be so great to see a fourth season. If that were an ending chapter, so be it—as a four-year college, sort of on that path. But I feel like it would be very presumptuous of me to say that [Laughs.] because I wrote a movie about a woman in a coma who cheated on her husband, that that would do anything. JR: Definitely. I think the theme that was—not so much presented to us but we all understood where Dan [Harmon, showrunner] and the writers were and what the third year meant to them, which was really digging deep and having the characters question something in their lives. Most of the episodes you’ve seen so far and the ones to come hit that idea. Like in “Documentary Filmmaking: Redux,” you understand what’s at the core of the dean , and this guy who tries so hard because he wants this school to be as great as the school he went to—but not realizing that it already is. That sort of lesson. Or to dig deep into Yvette [Nicole Brown]’s character and some upcoming things with her. Obviously, the promos for “Urban Matrimony And The Sandwich Arts” show a wedding, so she’s grappling with some decisions. The continued road of Joel [McHale]’s character, realizing that these people are family—and as resistant as he has been, he keeps being reminded this is important for his growth. Chevy [Chase]’s character dealing with the death of his father. There are some great scenes, speaking for all the characters in that way. AVC: There’s a very telling line in “Studies Of Modern Movement,” when Dean Pelton and Jeff are at the mall, and the dean says to Jeff, “This is going to be fun—or else.” That’s a good summation of the season so far. JR: Yeah, that blackmailing episode in particular—which of course I enjoyed immensely, getting to be paired up with Joel on one of the storylines—was such a fun week for us. At least for me. I can’t speak for him. Maybe he was miserable. I don’t think so. Maybe he was lying, but I think the singing pretty much showed us really, really enjoying each other’s company. AVC: Does the uncut version of that “Kiss From A Rose” video exist somewhere? JR: We did do the whole song. I have to imagine it’s somewhere, because at one point they teased the idea of revisiting that for the episode’s tag, but they did not. Because it’s a long song, it’s challenging—Seal doesn’t have the easiest range to sing in—and the fact that the karaoke machine was in front of us. So you’re trying to get into the song and figure out what the hell you’re supposed to be singing next. The writers have achieved a way to allow the dean to be involved with the study group, which is probably not a great thing for either party. It’s probably crossing some kind of line—administrative/student relationships—but the dean’s character already crosses boundaries in so many other ways, it seems fitting that he doesn’t really care. That gets addressed in some upcoming episodes, which is exciting. AVC: He’s just following in the footsteps of other previous TV school administrators, like Principal Belding on Saved By The Bell. JR: That’s true. But I have a feeling that Belding would never go as far as to blackmail and then dress like one of his “students” and sing with him. [Laughs.] Well, I could see them singing together in a karaoke bar or something, with Zack and the whole gang. But I think Belding wouldn’t present himself in Daisy Dukes when he meets with them at school. JR: Yeah, I didn’t even put that together. Maybe that’s sort of his way of making them one. In the dean’s mind, there’s the desire to be Jeff and there’s the desire to be with Jeff. But I think that proves that he really wants to be—maybe it’ll make them a couple. [Laughs.] Maybe have their names mixed together, like “Cringer.” “Craig” and “Winger” put together. Or Jeg? AVC: Dean Winger sounds like the cool kid from a Saved By The Bell-type show. JR: It does! I think we’ve come full-circle with that one. Or, like, the Dean Winger is a cool dean from Animal House that we didn’t ever get to see. AVC: Speaking of the dean’s desperation: When the character completely melts down like at the end of “Documentary Filmmaking: Redux” or “Conspiracy Theories And Interior Design,” you give him this weird, high-pitched wail. How did you arrive at that voice? JR: I think it came out of when we were rehearsing that particular scene in “Conspiracy Theories And Interior Design,” because that was a relatively new third act. I can’t remember what was originally happening in the third act of that episode, but the gunplay was introduced later—this whole crazy double-crossing conundrum. And so when we got there to rehearse, they wanted to see it up on its feet, and I felt like I just had to go for it. This guy really feels like someone just got shot. I think it was my version of hysterics. [Laughs.] I definitely lost my voice because of that, that evening. I remember the next episode we shot has Shirley’s baby shower, and if you listen, my voice is terrible in that scene. I’m going “Hey now!” and it’s coming out like “Hey now” [in a low, raspy voice]. My throat might have been bleeding that night. I definitely did some vocal damage. AVC: So what comes after the “long dark semester” of the season three’s first half? Is there light in the next batch of episode? JR: Well, no. John Goodman returns, keeping alive what he and I started in the first episode of the season—Dean Pelton is pretty much under his thumb while trying to keep the school afloat financially. Troy continues to be sucked into Goodman’s air-conditioning school—we’re on this sort of fun downward spiral, in a good way, toward our season finale. So I wouldn’t say that we’re turning around completely and that it’s a better day yet. That’s what we work our way toward when we get to the “all is lost” moment for these kids—and triumph hopefully. AVC: How would you describe the vibe on the set as season three came to an end? JR: When we wrapped, we didn’t know the March 15 news yet—we didn’t know we would be returning. We always had faith in that, and NBC was very upfront and assured us along the way that we would be back, so I think that’s what carried us through. But it’s a bittersweet thing, because you spend a lot of time with this extended family, and then you have this considerable amount of break. You’re wrapping in February and, if the fourth season happens, you come back at the end of July or August. It’s a long time off, so it feels like you just went to summer camp and now your parents picked you up, and you just want to go back to camp. But the good news is that we see each other socially, which is great, and we just did PaleyFest, so there’s been plenty of time to catch up. But I think the mood was, “No matter what happens, fourth season or not, I think we all know how”—I’m looking for the word—“miraculous it can be, and how rare it can be, to get more than one season,” let alone get to three. And I think we’re all very proud of the show that we’ve done so far and hope to continue. It’s an unknown right now, and that’s hard when you love something so much. AVC: Was there an air of relief during the PaleyFest panel, seeing as it happened after the show’s return was announced? AVC: At this point, what can that rabid fan base do to help ensure that Community comes back next fall? JR: A little bit of what they have been doing. I’m sure NBC always had a plan in mind, but I cannot imagine they weren’t tracking the reaction after we were put on hiatus—from flash mobs to the goatee profile pics to people on Twitter sounding off. I think all these things aren’t lost. There are a lot of shows that have been saved because the fans weighed in. Keep being vocal about the love of the show and the desire for a fourth season. You can never do not-enough. You can never not do enough. I’m trying to get my double negative correct there. AVC: What fan response have you appreciated the most, personally? JR: On the personal level, the people that follow you on Twitter are always nice to hear from. Both for the upset and the “glad you’re back.” And just seeing these videos of these flash mobs are so touching—people singing with their felt goatees. How can you not feel a little honored by that? Or touched? AVC: Beyond Community, you and your writing partner Nat Faxon just sold a script for an action-comedy with Kristen Wiig attached to star. Is she someone you knew from the Groundlings? JR: Yeah, we came through the program at the same time; we performed in many main stage shows together and improv. As we like to say, we went through plenty of collections of wigs and props that both succeeded and failed. I’m half and half at that. I think I was directing the show that Kristen ended up leaving to go to Saturday Night Live. Not that I had any part in her getting that. I just remember we had started the show and she got the great news and then everything took off for her from there. So it’s always been a late mandate that we really wanted to write for her, work for her—mainly because we’re friends, but also because we just love her and her voice and all the things she can do. And how can you not want to work with your friends? AVC: Seems like you’ve done a pretty good job of surrounding yourself with groups of collaborators that feel like family. JR: Yes. Nat and I met at Groundlings, and came through the same program at the same time as Melissa McCarthy and her husband Ben Falcone. And Kristen’s writing partner for Bridesmaids, Annie Mumolo, was also a Groundling. Maya Rudolph—all these people, we were all performing together. So it’s like any camp. Bridesmaids had so many Groundlings in it, it’s that kind of thing. You just want to work with your friends. AVC: And then you’re working on The Way, Way Back this summer? JR: Yes, we are. We’re in the hopes of getting everything together to direct The Way, Way Back, which we wrote before The Descendants, in June and July. So far we have Allison Janney and Sam Rockwell attached, so we’re still doing the casting right now, getting all the ducks in a row. AVC: How do you feel about approaching your first feature-length directorial effort? JR: Excited and nervous all balled up into one. Like panic attacks, waking you up in the middle of the night, going “What the hell are we doing?” [Laughs.] But I feel confident, for a variety of reasons. While we haven’t directed something, I’ve directed the Groundlings for years. As far as working with actors, I feel very comfortable working in that aspect of directing. And I feel like surrounding yourself with a good team—and we’ve met so many great, great people along our journey in that department—I feel like there’s no better time than the present for us to just start. And go for it. It’s the same reason we started writing in the first place: to start doing something. We wrote The Way, Way Back—no one asked us to. It was just written one summer. We had an idea, and we did it. And that became something we never expected, as far as getting out there, and that turned into the Descendants job. So all these things happened because we started. So I guess that’s sort of our theme, you know? Let’s just go. See what happens. AVC: You lived through the worst-case scenario for a first-time director on Community this season, so you know it can only get better. JR: Yes. [Laughs.] I know what not to do based on Dean Pelton’s actions, but that seems very, very obvious. 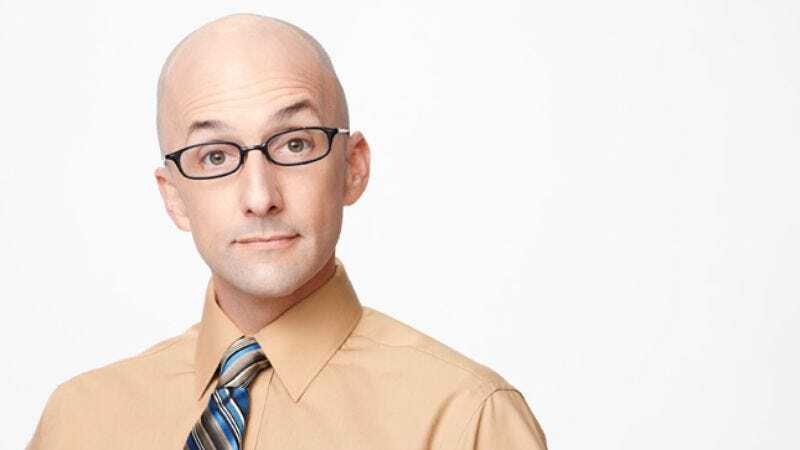 AVC: Dean Pelton is not a role model for life. JR: No. He is a role model for the desire to do better. He just doesn’t pick the best routes to do better. AVC: And that makes him a role model for comedy. JR: Yeah. There you go. He makes horrible decisions. Horrible.